No-one of the name Arthur Pritchett was recorded in the Census records for Bottesford and Muston during the years before the start of WW1. However, the man named in the Bottesford ‘church organ’ list of servicemen has been shown to be Arthur Harold Pritchett of Aslockton, Nottinghamshire, a baker employed by Arthur Germany at his premises on Chapel Street, Bottesford. 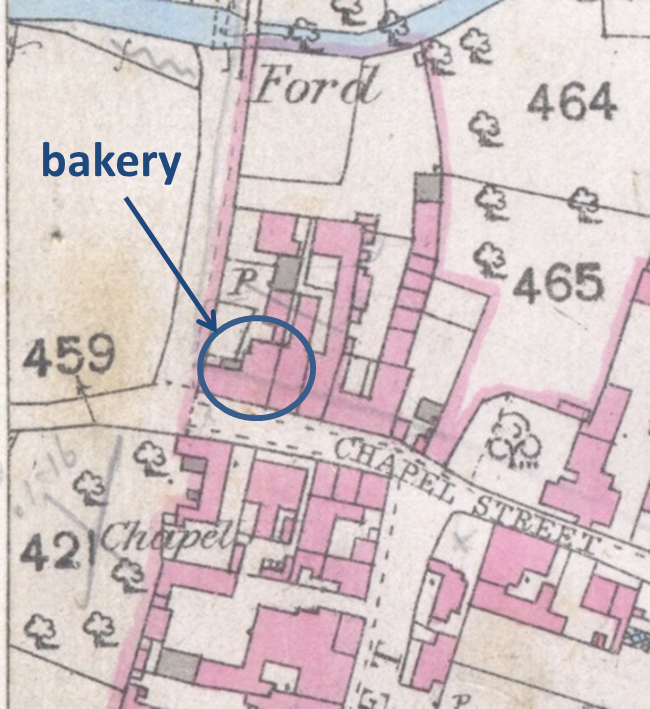 It is quite possible that he had taken up lodgings in Bottesford in order to keep the bakery’s hours of work, and so became regarded as part of the village community. Arthur Harold Pritchett was born on May 20, 1895, in Aslockton, Nottinghamshire. 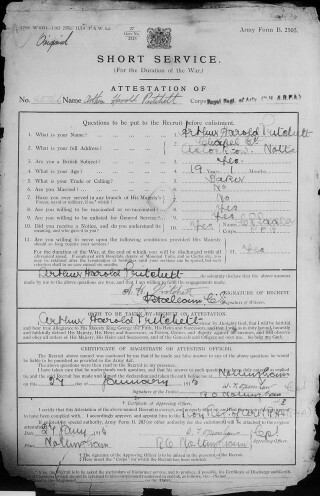 According to the census of 1901, his father was James Pritchett, born 1866, a boot repairer from Little Hallam, Derby. His mother was Eliza Pritchett (nee Kirk), born in 1867 at Aslockton. Arthur was the oldest of six children, all born at Aslockton: his siblings were Alice was born in 1898, George William in 1901, Harold in 1902, Agnes in 1904 and Joseph in 1907. He enlisted in 1915 and served with the Royal Field Artillery until late 1918, when he was admitted to hospital suffering from “bronchitis/influenza”. 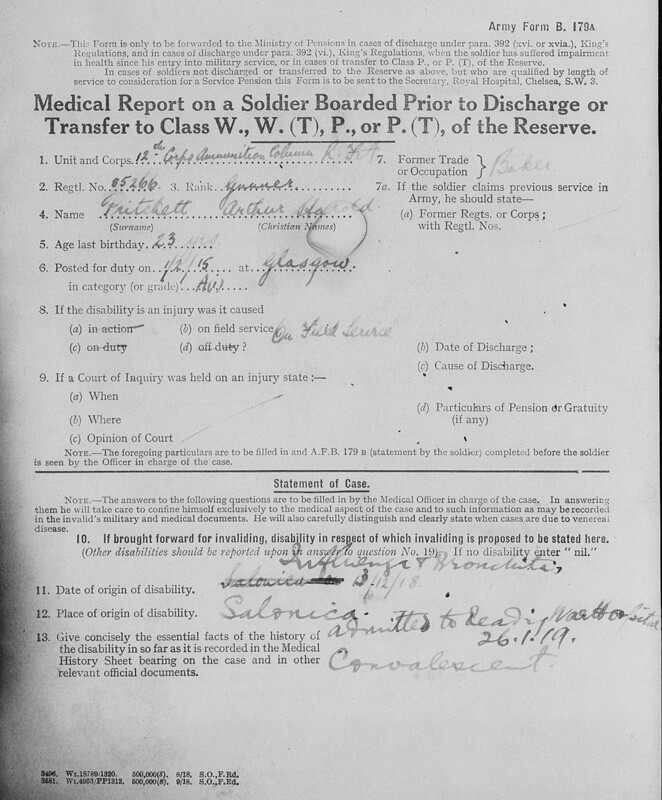 He was demobilised after recovering and leaving the military hospital in Reading in 1919, aged 24. Arthur Harold Pritchett and Florence Gertrude Smith married at Bingham in 1922, when he was 27 years old, and she was 23. Their daughter Edna Eileen was born on January 8, 1923, in Aslockton (implying that the family had moved back to Aslockton from Netherfield earlier in 1923). Their son Dennis H. was born in 1925, again in Aslockton. It is uncertain where he found work immediately after returning from the army, but there is a record that in 1923 he went to work on the railway. He started work as a railway porter on 16th July, 1923 (LNER staff records 31/10/1939). The Electoral Roll of Autumn, 1921, records that Arthur and Florence Pritchett had registered together in the Nottingham Rushcliffe constituency, polling station Carlton, and that their address at this time was 7, Norman Cottages, Netherfield Ward. In the Spring 1923 Electoral Roll they were still at the same address. His father, James Pritchett died in 1949, aged 83. His wife, Florence Gertrude, died in 1962, aged 63. Arthur himself died in Grantham during 1979, aged 84. 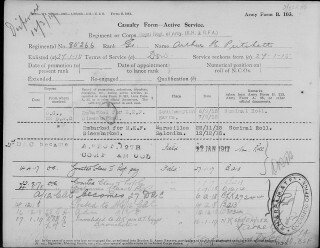 Arthur Harold Pritchett enlisted as 85266 Gunner, Royal Regiment of Artillery (R.H. & R.F.A.). His Attestation paper, dated 27/1/1915, states that his home was at Chapel St, Aslockton. He was then 19 years 7 months of age, a baker by trade. 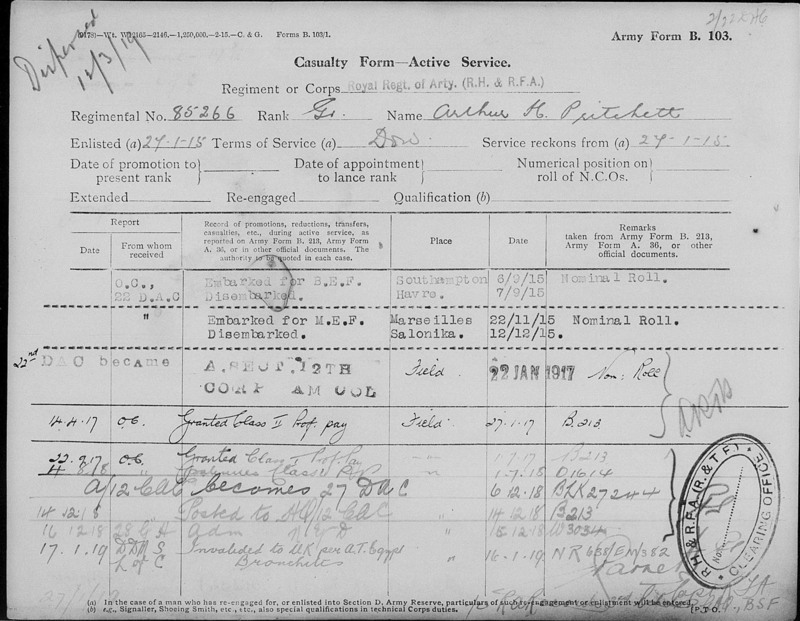 He enlisted at Glasgow, and was posted on the 8th May, 1915, as a gunner, and posted initially to 4a Reserve Brigade RFA before going to France on the 6th September, 1915. He fought in France for two months, and was then transferred to the Balkans, serving in Macedonia in the 12th Corps Ammunition Column for three years and two months till he fell ill with influenza/bronchitis. 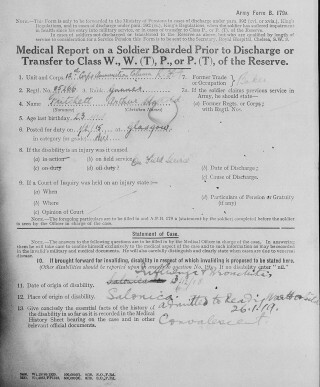 On 13th December, 1918, he was admitted to 28th General Hospital, Salonica, and then was moved to No.2 War Hospital, Reading, on 26th January, 1919, where he convalesced. At this time he gave his employer as having been A. (Arthur) Germany of Chapel Street, Bottesford. On 1st August, 1920, he was awarded the War Medal and the 1915-Star, and also received the Victory Medal on 21st September, 1921.